Dre Masso is an absolute legend of the industry. Between working at some of London’s best venues, becoming a tequila guru under the famous Julio Bermejo, opening a range of venues and spearheading the drinks program at Bali’s successful Potato Head Group for four years, there seems little he hasn’t tried and thrived at. Dre is also one of the creators of popular tequila brand, Altos Olmeca, and is a fervently passionate supporter of sustainable practice in all areas of bartending and drinks production. 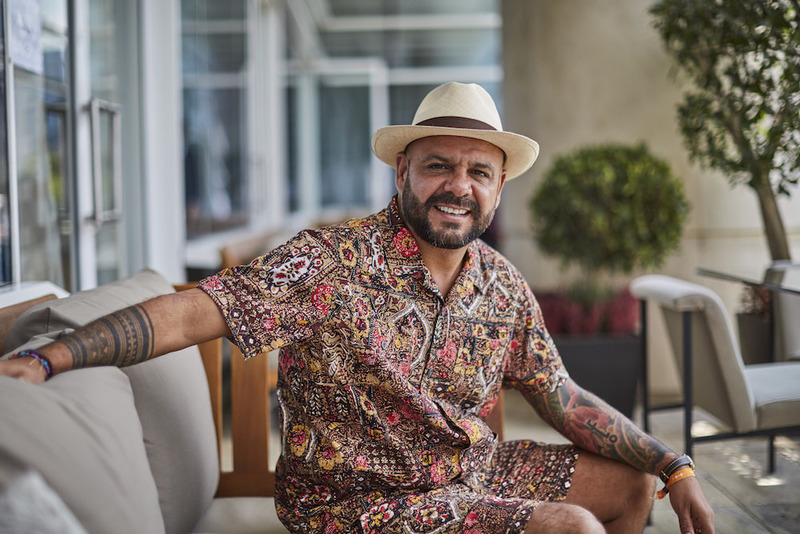 Drinks World sat down with Dre on a recent trip to Australia with Altos Olmeca to chat about his diverse career and his love of cocktails and tequila, as well as find out his one, major piece of advice on how bartenders can start implementing sustainable practices in their venues. How did you start out in the bar industry and why did you choose bartending as a career? DRE MASSO: My Mum was a nanny and she moved from Columbia to London in 1975 to work for a family. On weekends, she worked in bars and restaurants. As a single Mum, she often had to take me along with her to work on the weekend, and I would sit in the corner and watch the chefs, waiters and bartenders. It was a loud and fascinating environment to grow up in. When I was 15, I started working in one of the leisure clubs (member’s clubs) that she worked in, collecting glasses. I studied photography at college, which was quite an expensive area to study, so I worked at a bar called Joe’s Bar and Grill, in Richmond, to make some money. It was really fun, and it was where I was introduced to the world of cocktails. I found myself studying less and working more. At the end of college, I realised I want to pursue hospitality. I then went to work in Soho, London, at a place called The Rock Garden. It gave me a taste of Soho and the diverse cultures that travel through there. It was amazing. Shortly after that, I began working at a place called the Atlantic Bar and Grill. It was extremely cocktail focused and was a pretty popular celebrity hang out. I really cared about the product they were serving, and I had a deep respect for the focus on service and quality food. Those three bars were really gave me my start in bartending and, since then, I think there are around 35 bars I’ve either opened, consulted or worked for or with. What was it about cocktail culture that you found so enticing? What did you love about it? DM: Well, two things. Firstly, it was the environment of the bar. Every day is different, and you speak to new people all the time. In the types of bars I’ve worked in, there were so many fascinating characters that would come in. Secondly, I just love cocktail creation. I love the trial and error of putting together a recipe – the process of recreating or coming up with something new. There’s no greater reward than delivering your creation to someone and receiving a satisfied response. It’s not rocket science, sure, but it’s great to give someone joy. I am fascinated by flavours, manipulating them and seeing what they can do. I find it almost therapeutic. It’s a skill that you learn. When you start out, you don’t really understand it, but as you chip away and add these building blocks of knowledge, you get better. Through your bartending career, you’ve worked in bars across the globe. Is there are particular venue that helped shape you as a bartender? DM: Lonsdale, in Notting Hill was particularly important, as it was where I first started working with my business partner Henry. It was a New York style bar, very cool and very fast paced. From there, I opened my own venue, Green & Red, in 2005. It lost me a lot of money, but I wouldn’t change a thing. It was such a big part of my life, and I was extremely proud to bring a slice of Mexico to London. I, now, co-own a place called Opium. It’s a Chinese cocktail and dim sum parlour in Chinatown. The bar business is hard, but we have a good formula there. It’s a great location, good rent, low staff costs, high gross profit and it does pretty well. But, it was Bali that really changed my bartending style. Those four years in Bali changed not just my cocktail making, but my whole approach to the craft. The people I worked with were also fantastic and business inspired my creativity. DM: I find Tokyo, Japan incredibly inspirational, although I haven’t actually worked there yet. They get really ‘into’ things over there. That’s part of the culture and the philosophy. From a young age, they establish what you’re into and where your skills lie, and you focus solely on that. You here these stories of Japanese bartenders that religiously practice and rehearse their craft in order to be the best of the best. That mentality applies to trends as well. Consumers get into the world of whisky and become super connoisseurs, while their whisky producers make some of the best whiskies in the world. From what I’ve seen, tequila is doing pretty well over there. It wouldn’t surprise me if they took mezcal, which is starting to take off across the world, and run with it further than most. What has been the biggest challenge of your career to date and how did you overcome it? DM: There have been loads. Every time you step into a new role or pursue a new idea, there’s some kind of challenge. I think I’m pretty openminded to overcoming those challenges. DW: What was it about tequila that spoke to you more than any other spirit? DM: Ahhhh, the spirit of the spirit (laughs). Well, firstly, it’s fun! There’s a place for tequila – it comes out at a time of celebration or when you’re letting your hair down with friends. There is also a bit of personal connection, as I’m Latin American. Then, later on, I was exposed to the ‘good stuff’ and began to understand how special the drink is. Once you start to get into tequila and you visit Mexico, you meet so many incredible people and you become connected to it on a personal level. It’s just so enriching. I saw that love of tequila grow in so many of the staff members that worked at Green & Red. Jeremy Blackmore, co-owner of Tio’s Cerveceria in Sydney, worked there for a short time, and I’ve had other ex-staff become tequila ambassadors, makers and bar owners. You just don’t get that level of connection to the spirit from a vodka bar. DM: Yeah, I like that word. It is very much to do with the way you’re looked after, working in tequila. In Mexico, people say when you arrive at their house that you’re home. Once you’re through that door, you’re in your house. And they mean it, so sincerely. I’ve heard so many stories of bartenders hiring Mexican kids behind their bars, and when they go to Mexico eventually, this kid has set everything up for them. He’s there at the airport, he gives them a car, he gives them a hat and they eat at his family restaurant. I haven’t met people from any other country that treat you that way. They’re ecstatic and intrigued that there are foreigners interested in experiencing their culture. I’ve been to Mexico around 20 times, and I always find the experience inspiring. I love taking new people there and watching them open their eyes. From an established bartender to becoming a spirits creator, did you always know you wanted to go down that path or did the opportunity present itself, and how did it present itself? DM: No, we didn’t plan to do this. There was an element of serendipity there. Henry and I were pretty forward thinking and open to pursuing new opportunities. We toyed with the idea of making an Old Tom gin, before there was one available commercially. That didn’t end up happening because of the dynamic of the team, but I think that demonstrates that we knew spirits production was a possible avenue. Tequila seemed a natural fit for us. We spoke to a few people about the idea to create a tequila brand, and we were put in touch with House of Tequila who were experimenting with some new blends. We were brought in and allowed to be a part of it. They were very generous with the project. It is kind of unique scenario as we’re not brand owners, we’re collaborators. We worked with an established company that had supply channels, marketing, PR and distribution. They were going ahead with the project anyway, and we jumped on the back of it. I haven’t had that experience of setting something up from scratch. Sustainable practice is core to the Altos Olmeca brand. How did you first learn about and be involved in sustainable practice? DM: I first thought about when I was working London’s The Lab in 2001. We were a busy bar every day of the week, but we never made any money. I could see that there was a misuse of ingredients, including ice. We’d buy it in bags and we’d always order too much in case we ran out. At the end of the night, we usually had to slit the remaining bags and leave the ice to melt. Sometimes we’d even use hot water to make the ice melt faster! So, we ended up using hot water, that we paid for, to melt ice, that we paid for. After this, I started working for Jamie Oliver at his first restaurant, 15, and he was good at highlighting issues of sustainability. A lot of his experienced chefs were also that way inclined. One of them was a guy called Arthur Potts-Dawson. He did a TED talk quite a few years ago about the amount of waste we make. He also set up an enterprise called the People’s Supermarket, which was all about selling the things supermarkets didn’t want. If you worked there, and you were part of that community, it rubbed off on you. He’s been a big inspiration to me and we’ve done a couple of projects together. So, it’s always been at the back of my mind, but I didn’t really think about it in the term of ‘sustainability’. It was really that Bali experience, looking out on the trash covered beach every day, when it all came together in my mind and I released we needed to make some sensible decisions in the bar. You’ve, clearly, be involved with sustainable actions for years. Why do you think sustainability in the bar industry has gained so much traction of late? DM: I think the reason it’s so widespread nowadays is due to the internet. It’s an extremely powerful source of information, now that you can have the knowledge of people like Iain Griffiths and Ryan Chetiyawardana at your fingertips. As a result, we’ve been able to organise conversations similar to the one we’ve had today, where groups of bartenders from different cities around the world meet, and it’s brilliant. They continue to talk about it afterwards, whether they meet up personally or talk amongst themselves online, and the message spreads. After years of seemingly not caring, we’ve had the discussion spread very fast. For bartenders looking to introduce sustainability into their venues, but who may be overwhelmed by the range of practices you can implement, where do you think they should start? DM: You need to get your team on board. If you get your team together and ask, “How can I get you all involved?”, you’re going to get a bar back that says, “You know what? We waste so much water at the end of the night with the ice.” Okay, so how can we resolve that? A lot of the time those working in the bar don’t hear about the problems the financiers or owners have, and we need to be more open about profit and loss. Hearing your boss say, “Food costs are way too expensive. They need to be lowered,” can inspire answers from within. You never know, you might have someone on the team who studied environmental science, or grows their own ingredients, or was an engineer. You’d be surprised who is under your nose. There’s a few other things that can help you. There’s a good website called fishnick.com. They’re an agency/organisation that has helped a lot of companies in America to achieve energy sufficiency. They look at simple things, like cleaning the filters on your fridges every three months or changing your lights to LED. They’ve been paid over tens of thousands of dollars to do this research, which they then share. If you had to pick one, what would be your ultimate tequila cocktail? DM: It would have to be Tommy’s Margarita. I know Tommy and I know his son, Julio – they actually conducted my wedding! It’s also a great drink! It’s tasty, it’s easy to make and you can taste the tequila. It’s also quite forgiving, so even if you add a bit too much lime, you can get away with it. What do you think could be the next big trend in the spirits world? DM: I’ve never been good at this (laughs). Although, non-alcoholic liquid is a trend that I never thought would take off as it has. Everywhere that has it, I ask them, “How’s it doing?” and they all say it’s flying off the bar/shelves. There’s a place in London called Crucible, which is set up by a bartender called Stuart Bale. It’s a workshop where bartenders can go in and use the rotovap and the sous vide, and all the distillation equipment. Stuart has said to me that 90% of the bartenders that go in there want to recreate Seedlip, so we’re definitely going to see more of that. I would never have picked that. The same way I would never have picked low ABV cocktails to be as popular as they are. No one has ever asked me for less alcohol in their drink. Usually, they ask for more! Both are very pleasant to drink, and there’s certainly a place and a time where you’re looking for something that isn’t very alcoholic. It allows you to still feel a part of the occasion when you can’t or don’t want to drink. So, what’s next for Dre? DM: I do have an up-and-coming project called Fam in London. I’ve been given an opportunity back in London along with my parteners, through my company, Communidad, to create a new venue concept. It is as it sounds; food recipes will come from the family and friends of those who work there. We have a Trinidadian guy who is putting forward a few of his family’s recipes and I’ll be putting forward a couple of my Mum’s recipes too. We’ll be using British ingredients where we can, but it’s all attached to the idea of family. The drinks will work the same way. They’ll be London-centric but also linked to our histories. So, for example, they’ll be a drink from Julio as a nod to his influence in my life. The venue will play vinyl music and the philosophy very much is, if you were coming into my home, this is how you would be served. It’s a very quick turnaround, so the space will open on December 1st. Other than that, I’d love to try out making some bar equipment in a sustainable fashion, if the opportunity presented itself.